ITB Pain? You might want to Stretch! 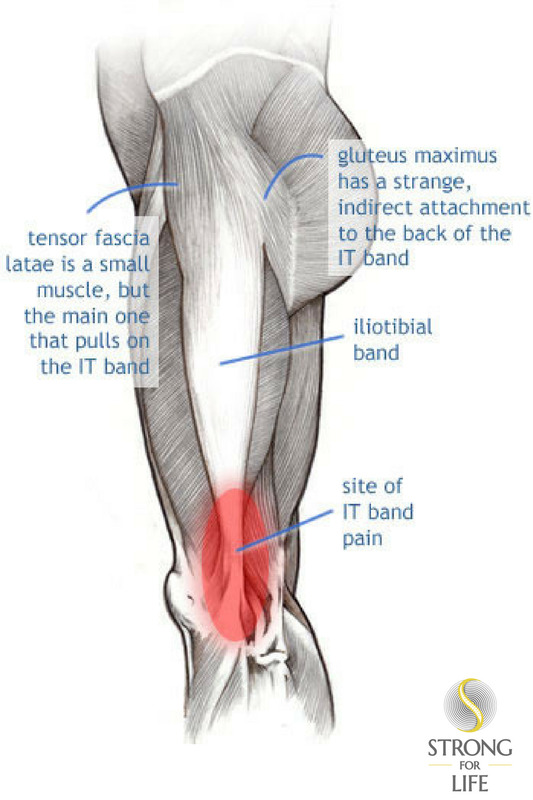 ITB (Iliotibial Band Syndrome) is one of the most common aliments of runners. ITB often presents itself as pain on the outside of the knee. Overpronation or underpronation can often be the cause of ITB, but more than not, it's due to inflexibility. Runners often think ITB is a knee problem. That's because the pain along the outside of the knee is the end result. Actually, the Iliotibial Band is a part of a longer tract which includes the Tensor Fasciae Latae (TFL) that originates at the iliac crest continuing down to the Iliotibial tract and attaching to the tibia in the lower leg just below the knee. This muscle braces the knee when walking. Without the iliotibial band your leg would collapse. Handy muscle, huh? The real culprit often causing Iliotibial Band Syndrome is the 9 to 5 job desk job. Think about it, if you sit at a desk for 8, 9, 10 hours, your hip flexors aren't living up to their name. They're not flexing. They're stuck in the same bent position, getting tighter and tighter. Then you hop up and go for a run most times without any stretching before or after. A combination that spells Iliotibial Band Syndrome is coming over time for some. Stretching is one of the best ways to help recover from Iliotibial Band Syndrome as well prevent it from happening in the first place. Click the link for some great stretching and strengthening exercises for Iliotibial Band Syndrome from Knee Pain Explained. Stretching of course isn't the ITB "cure-all" for everyone, but it is worth talking to your therapist or trainer about it, if you have one. Otherwise strongly consider seeing a specialist about the issue and try to avoid conventional pain killers as these are usually very ineffective. Also, if you haven't experienced ITB problems, starting a regular stretching routine consisting of dynamic stretches before your run (i.e., stretches that are comprised of active movement specific to running such as heel kicks, knee lifts, jump squats, side shuffles, etc.) and static stretches after the run (more traditional stretch-and-hold type movements) will hopefully keep you ITB-problem-free. ITB release techniques provided at Strong For Life might not be the most comfortable to experience but are highly effective at releasing the tension and pain very quickly. Do an easy warm-up 5-minute jog; then do your pre-run stretch. Don't bounce. The stretch should be slow and gradual. Stay relaxed and breathe while you stretch. Good luck and don't forget to seek support when you need it and ideally before the problem stops you from your running.